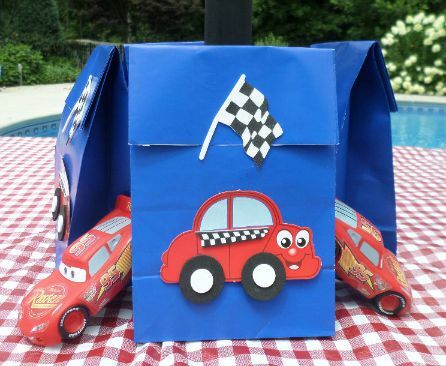 Looking for some Cars party ideas for games, party goods and decorations? 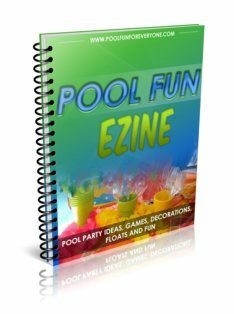 If you own a pool and want some fun pool birthday party ideas using floating traffic signs, tire swim rings and inflatable cars check out what we did for our summer fun pool party with kids - girls and boys - from 4 to 10 years old. 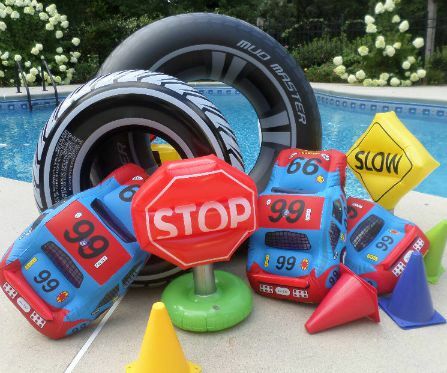 What makes this kids pool party theme so fun, is all the inflatables - from blow up signs, to cars to swim rings that look like tires. 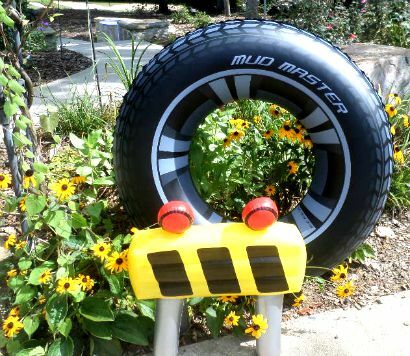 Place inflatable tires and signs along the path or sidewalk to the pool or party area. Drape a checkered pendant across the pool. It also served as a turn around point for the pool races. It's only about $8 for a 100' pennant. 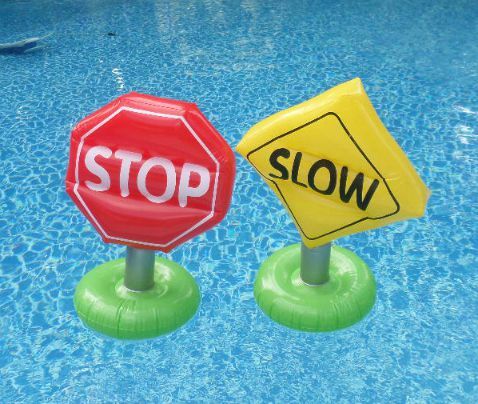 The inflatable signs are weighted so they stay upright in the pool. 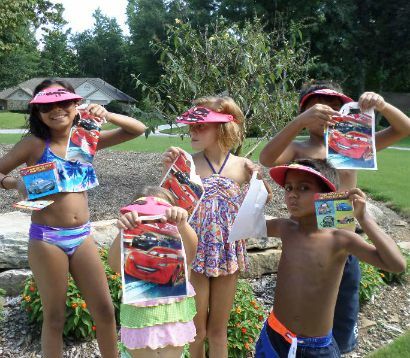 We had them floating in the pool for "decorations" and used them later for our cars themed games. They come as a set of 6 different traffic signs. 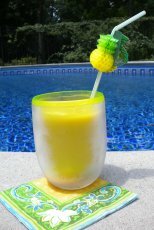 The colors are bright and vivid and we found the set to be very durable - despite lots of kid abuse. This large inflatable car was a big hit and fortunately we had enough of them for each boy to take one home at the end of the party. 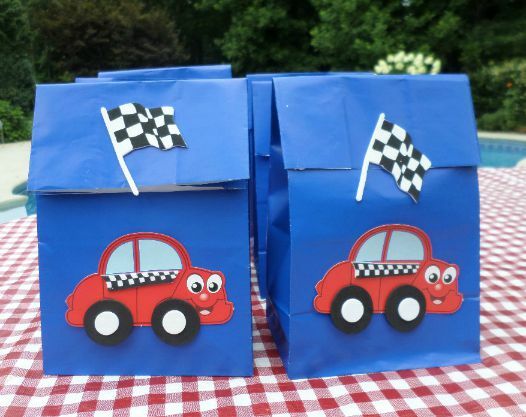 Blue party bags are embellished with a cars themed craft kit and a black and white checkered foam sticker keeps the bag sealed. We placed our racetrack runner to go from the bottom of the steps to the pool. The fabric is durable and made for indoor or outdoor play. 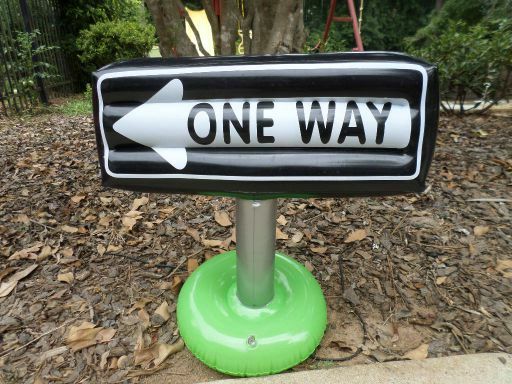 It does have double stick tape on it - but it didn't stick to the cement so we placed some of the weighted inflatable traffic signs on it to keep it from blowing in the breeze. The runner measures 24" x 10' so you may need more than one depending on how you are going to use it. 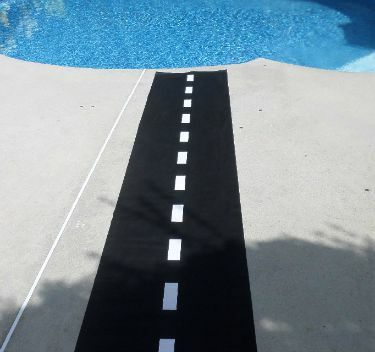 Ours was simply a way to decorate for the themed pool party. While waiting for the guests to arrive you can play the Scavenger Hunt Game. It can be played over and over - so when a new guests arrive just play the game again. 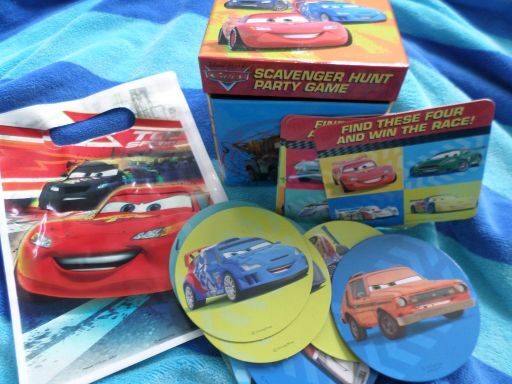 The box is filled with round cardboard discs of the different Disney Cars. Hide them around the party area. Hand out Cars Disney Cars treat bags to each of the guests. Give each guest a card - it will have a picture of 4 different cars. The kids look under the bushes and rocks to find their 4 cars. The first guest to find all 4 of his wins. We let the kids take turns hiding the round discs and before you know it, our party group played the scavenger hunt game at least 5 times. 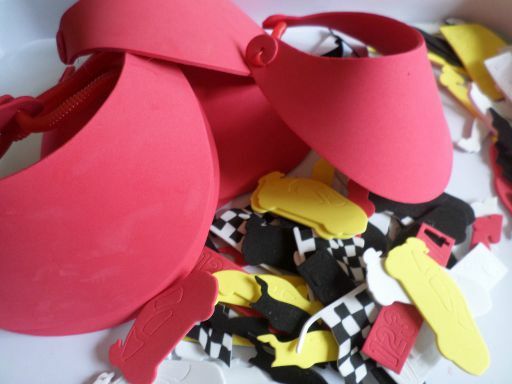 Another activity to do while waiting for the guests is to have the kids decorate red foam visors with car themed foam stickers. Disney Cars Temporary Tattoos were a big hit. 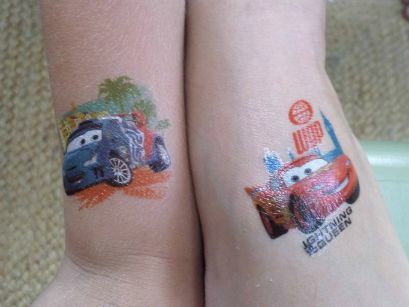 Kids found all kinds of interesting places for their more than one Disney Cars Tattoos. 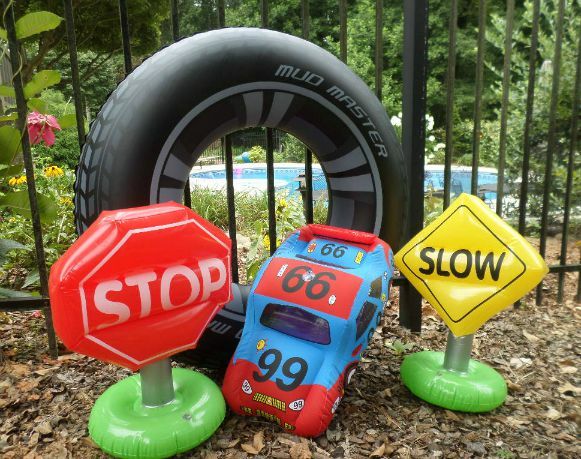 Kids pool party games include lots of fun races using tire looking inner tubers, inflatable cars, road signs and cones. 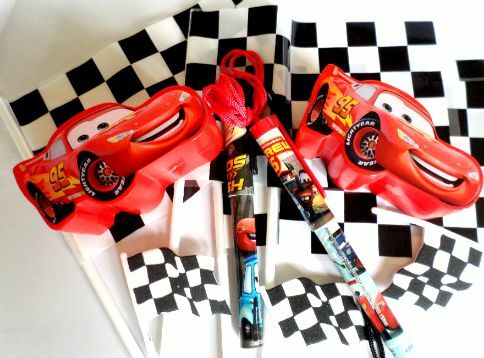 Break up into two teams giving each team a name like Lighting McQueen and Tow Mater. 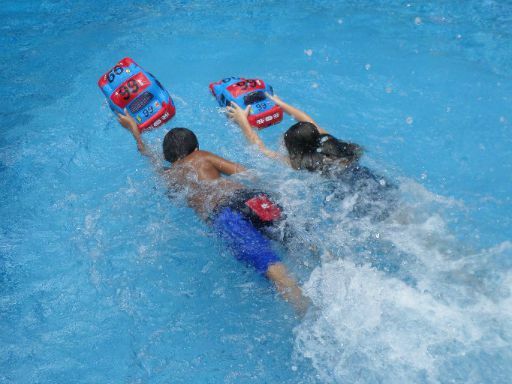 Provide each team with an inflatable "tire" and have them race to the black and white checkered pendant and back. Hand the tire to the next team mate and the team that finishes first wins. 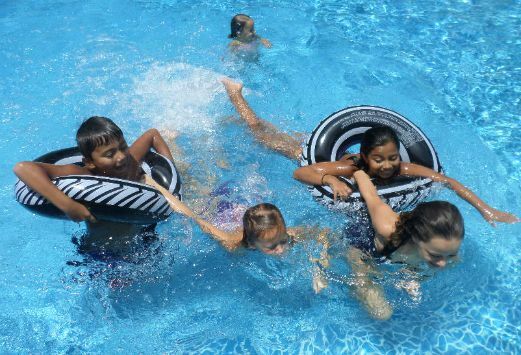 Another game that uses the inner tubes is to have the player pull their team member to the pendant and back. 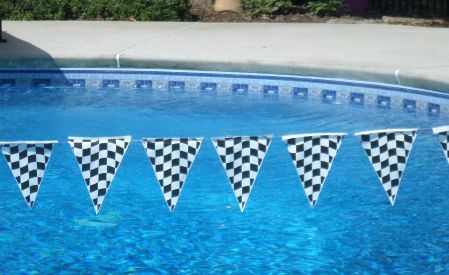 Using a large black and white checkered flag have one of the adults stand near the edge of the pool and announce, "Ladies and Gentleman, Start Your Engines." 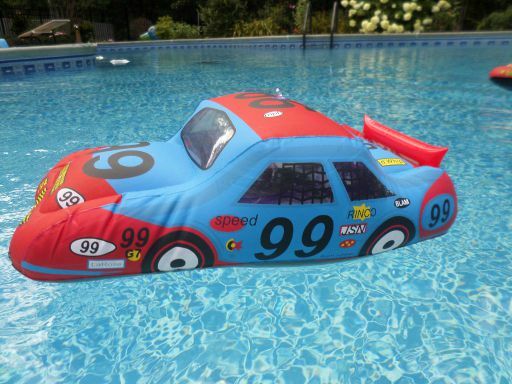 Each team gets an inflatable car and swims to the end of the pool or pendant and back, handing off the car to the next team mate. The team that finishes first wins. The car is about 20" when inflated and it comes as a set of 3 cars with free shipping if you are prime. 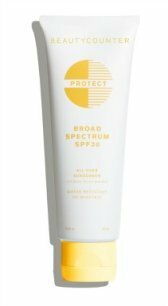 The colors are nice and vivid and the plastic was very durable - no air leaks. Kids had great fun playing with them when the games were over. Assign a color to each team and provide a traffic cone to each player. One at a time a team member swims with his traffic cone to the other side of the pool and swims back to tag his teammate. 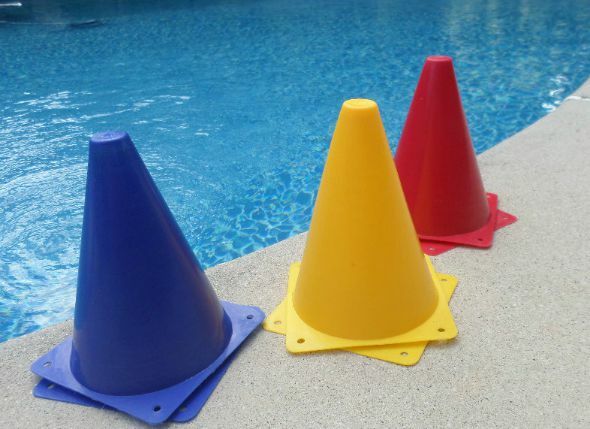 The next team member takes the second cone and swims to the end of the pool and stacks it on top of the previous one. 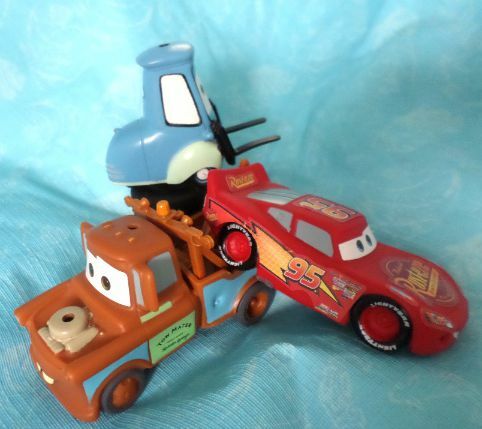 I purchased 2 sets of Cars Dive Toys. 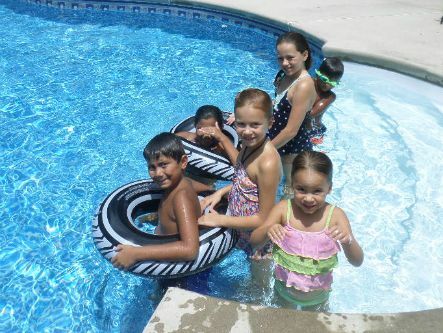 Throw all 6 dive toys (we had two teams of 3 kids) into the water at a depth that fits your swimmer's ability. When the adult yells "start" one member from each team swims to the bottom of the pool to collect one dive toy and returns it to his team. The next team member goes to collect another dive toy. The team that collects the first 3 dive toys wins. 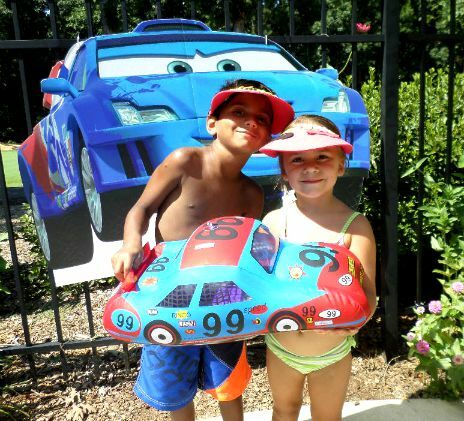 Car races, scavenger hunts, dive games and more make Race Day a great pool party theme for boys and girls.